This is one of my favorite sequences from the NHL season so far. Going up against their very formidable division rivals from Winnipeg, and coming off their first loss after a 10-game winning streak, Nashville took all of 10 minutes to blow the Jets off the ice. The Predators finished the job by chasing the Winnipeg goalie with two shorthanded goals in the same power play—a feat that, by my calculation, has only happened one other time this season. First, Austin Watson led a 2-on-1 from his own blue line and fired a perfectly placed shot far-post on the inexperienced netminder Michael Hutchinson. 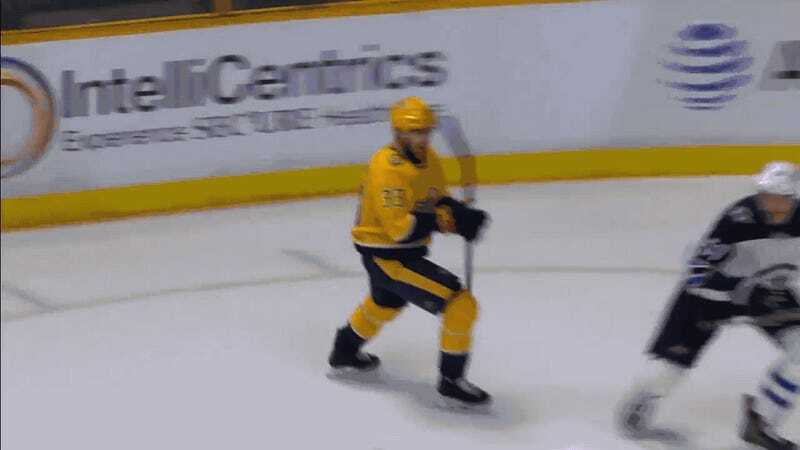 Thirty-four seconds later, Viktor Arvidsson chased down a loose puck in his offensive zone, then ran a give-and-go with Filip Forsberg that rewarded him with an easy point-blank shot to make it 3-0. The Predators are playing for nothing more than playoff seeding—and maybe a Presidents’ Trophy if Tampa Bay falters—but they’ve been hustling with something to prove as all of Nashville tries to recapture its lightning-in-a-bottle Stanley Cup Finals run from 2017. A couple of quick goals in March won’t bring them what they most want. But in front of an electric crowd, with a likable cast of players, everything Nashville’s doing is still loads of fun.